Congrats to Our Resident Arnold Palmer! 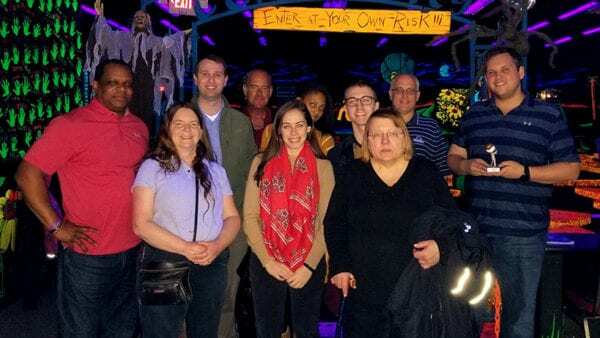 Last month, employees participated in our third annual mini-golf tournament. We entered Monster Mini Golf in Jessup, Maryland, with our game faces on, ready for some heavy competition. Despite the razzing among players, putts were made and skills were tested along the neon-glowing indoor course. And, for the first time, James won top spot! Not only did he get to hold the coveted championship trophy, but, more importantly, he now holds bragging rights for a year. Take a swing with us on your next project or join our professional team. Call Real Projectives at 888.357.7342.